The post is the first of three considering Elizabeth Warren’s first term. 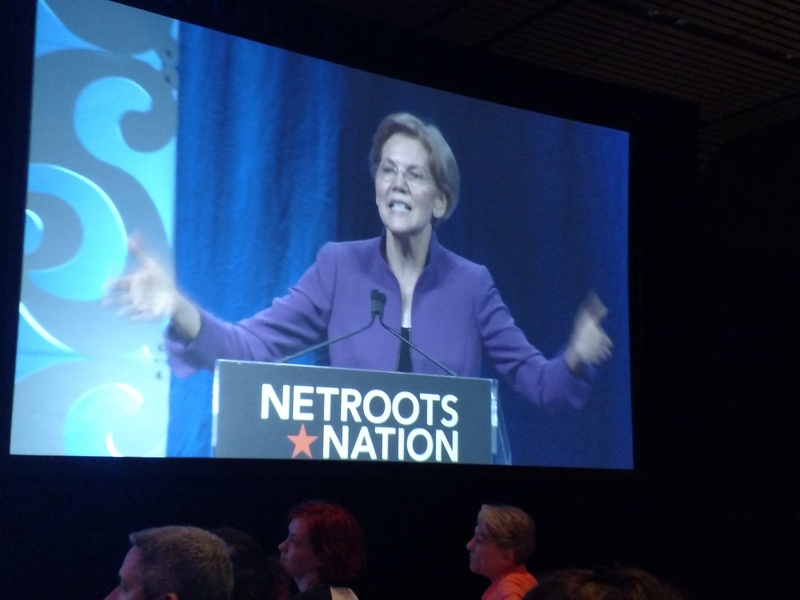 NEW ORLEANS—United States Senator Elizabeth Warren calls her Netroots Nation visits a family reunion. Her relationship with this conference, and the progressive grassroots generally, certainly predates and has profoundly influenced her political career. She first spoke to Netroots in 2010. It was part of a victory lap for Warren. The week before she spoke to activists in Las Vegas, President Barack Obama had signed Dodd-Frank, which brought to life the then-law professor’s regulatory baby, Consumer Financial Protection Bureau. Cheers erupted in the event hall. 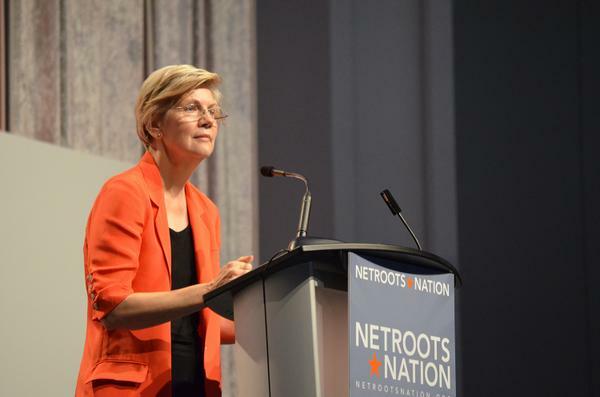 Warren has been a staple of Netroots gatherings since 2010. She returned as a Senate candidate in 2012 and has been going ever since. A reliable draw like at events in and out of Massachusetts, she ignites the crowd, capping her remarks, as she did in New Orleans, with a rallying cry to win. But win what? Reelection is on the list, but is that all? Nothing public will happen until she after this November. However, inching toward a White House bid is a reasonable read of her actions. There were two tells were in New Orleans. In an allusion to Senator Majority Leader Mitch McConnell shutting Warren down for quoting Coretta Scott King, signs labeled “persist” had been distributed before her Netroots address. Supporters dutifully and energetically waved them during her speech’s crescendo. The second came during a talk at Dillard University across town. Asked what changed from 2016—she repeatedly declined to run that year—that might prompt her run in 2020, Warren pointed to Donald Trump before pivoting off the subject. Warren gets a question about why she didn't run in 2016 and whether anything has changed since then. "Two words: Donald Trump." But she then pivots to attacking the Kavanaugh nomination. Despite some media’s impulse to read everything as proof Warren will seek the presidency, there are ways to play down these factors. Warren’s banner-wavers look great in ads—for reelection. Speculation about her ambitions can up her leverage in the Senate where she is all but certain to reside for at least the next 24 to 30 months. As presidential speculation mounts this remains true. Warren’s reception at Netroots proves it. Dawdling on 2020 still carries risks unless, but Warren’s plans to run—or not—may define the ultimate shape of the nominating contest. While old-fashioned celebrity is a factor, the adulation she receives reflects appreciation for actual accomplishments. Warren’s note about the CFPB, an agency now threatened by Trump appointees, appears regularly before big crowd, especially when she is out of state. “Ever since that rousing celebration eight years ago, I have left every Netroots feeling inspired,” she said. Like other public remarks, there are reminders of her own family’s struggle and condemnation of the wealthy’s serving power over Washington. The biography particularly adds to the down-to-earth qualities that have earned her enduring support from many moderate voters as well as progressive Democrats. There were turns that seemed to emphasize Warren is at least leaving space open for a bigger decision. She has increasingly emphasized broader topics. While much of the press focused on her calling the criminal justice system is racist—a remark opponents dishonestly spun as a slur against individuals in law enforcement—Warren also riffed on the current state of politics. Though capped with a rebuke of the status quo—”Our politics is a politics of unity.”—and base-pleasing lines, she described three things corroding American political culture. The first is the longstanding issue of Citizens United, the Supreme Court decision that broke the seal and began a flood of unlimited outside spending on political campaigns. The second was Republican interference with democracy itself through disenfranchisement and gerrymandering. 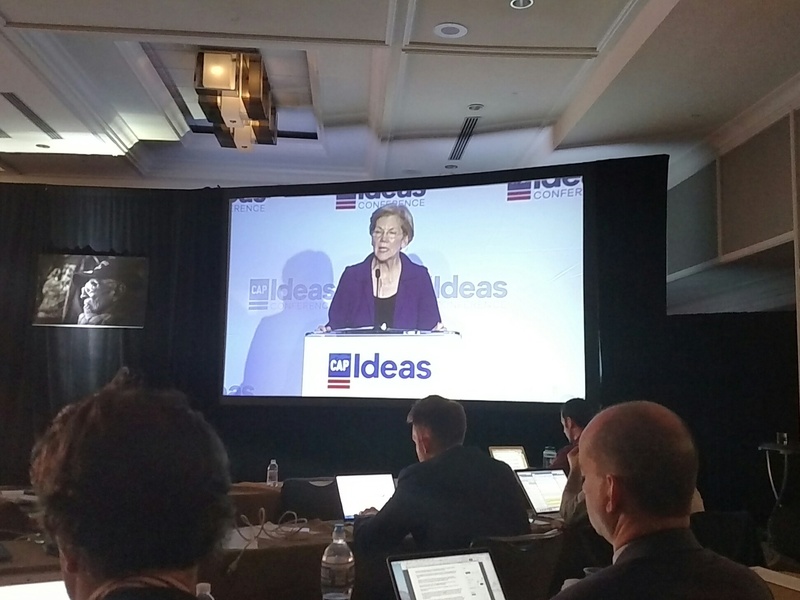 Warren discussed this issue in May at the Center of American Progress’s Ideas Conference. She also committed money to battle gerrymandering efforts and panned the electoral college then. “We must be willing to defend our democracy. We must call the attacks what they are un-American,” Warren said in May. The third point Warren made in New Orleans also echoed, if more obliquely, another from her Ideas Conference speech. 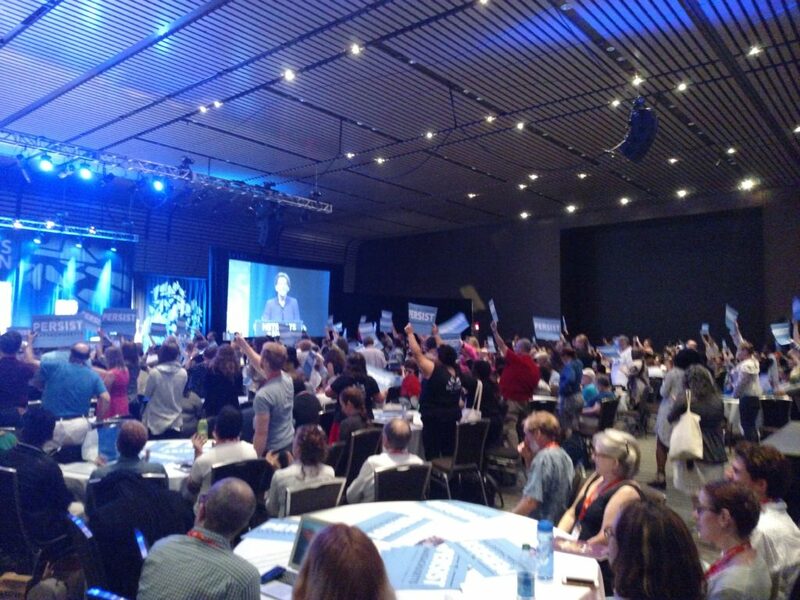 “And this, the third: The rich and powerful profit when government doesn’t work for working people – and they’ve learned that the best way to stop us from changing the system is to set working people against each other,” she told Netroots Friday. Although unlikely to turn her skeptics, the declaration that all working people are on the same side is a classic, broad appeal. It’s not just for the base. In May, Warren insinuated a related phenomenon was just as bad. Slipping into an information bubble or comfort zone could lead to misinformation, she warned. Warren didn’t take that tack in New Orleans, but she easily could have. That may be where Warren’s power as a theoretical frontrunner in 2020 is greatest. Unlike Vermont Senator Bernie Sanders, Warren comes from—and to—the activist left a well-established figure within the Democratic party itself. But, holding few if any positions that would anger progressives, Warren can lead them. Nor is Warren an absolutist. She has red lines and is willing to reject incrementalism—in 2010 she rejected defanging the CFPB to save it. However, she can go back to the base, in a way that few can and credibly ask for patience—if not always. Then again, this may be idle speculation. The senator does need to win reelection first, something those in New Orleans were just as happy to facilitate. There are practical considerations too, like how both her and former Governor Deval Patrick running would cleave the Massachusetts activist and operative classes. Moreover, the values she espoused throughout her speech here and in other speeches are both universal and echo the reasons she got into public life. Warren’s prior life in academia took a turn after she wrote The Two-Income Trap with her daughter. She embarked on a series of appearances on the Dr. Phil show to broaden her impact. Running for office, she told the former alternative weekly, had become part of that endeavor. In that context, Warren’s broader themes are natural extensions of her decades-long project of helping the disempowered. The presidency could follow, but is it inevitable? 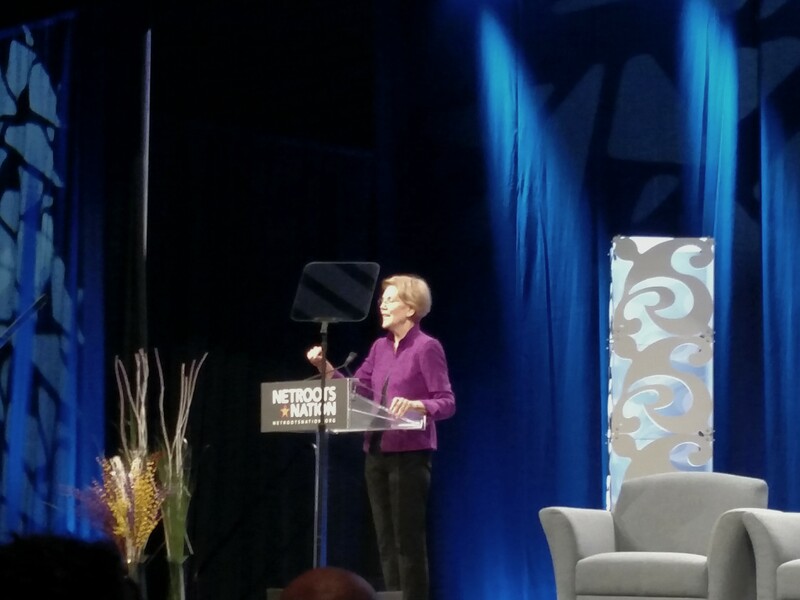 In her closing, Warren returned to the idea that Netroots was a family reunion. She recalled how the Netroots community were there for her. “Let’s build a better future for the country we love.” she continued. As at previous points in her career, many are keen to take Warren up on that offer however it manifests.